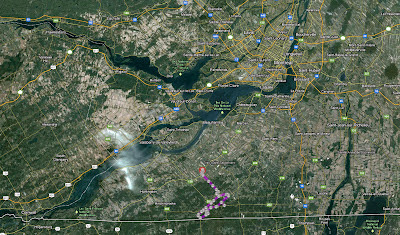 We ride from the Battle of the Chateauguay Museum at Allan's Corners along the Chateauguay river, south through the exposed bedrock of The Rock, to quiet climb up Covey Hill on Rang Lemieux/Brooks side road, then along the top of Covey hill to strange Dorea, then downhill through Franklin, St-Antoine-Abbé and then through the Rock again back to the car. 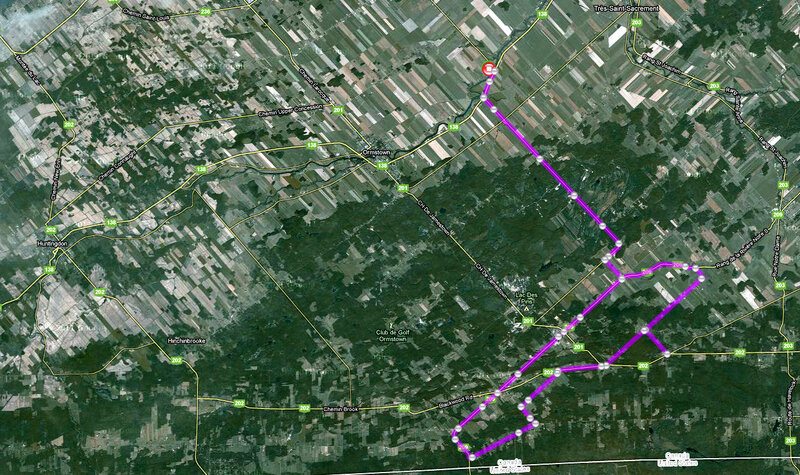 From Dorea the downhill starts and the 24 km back to Allan's Corners is a very fast ride. If you want a longer ride, do this exact ride, but park the car in Howick or Ste-Martine and ride to Allan's Corners along the perfect-for-bikes road on the north side of the Chateauguay river. 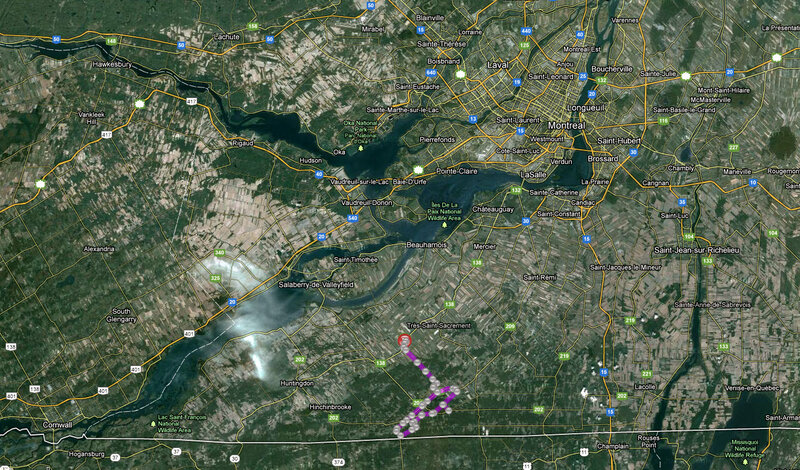 Both these villages have bridges to cross the Chateauguay. At Howick (aka Georgetown or Tres St-Sacrement) the old bridge was recently renovated and is now bike only (cars now cross a modern bridge located one kilometre east). Road Closure: The Rivière aux Outardes Est bridge on Montée de Covey Hill is closed. Along the Chateauguay river, south through the exposed bedrock of Montée du Rocher (The Rock), then up Covey Hill on the mellowest, quietest and scenicest roads. Sunset over the Chateauguay river, as usual the end of the ride and of daylight coincide. After the top of Covey Hill, you have 24 km of downhill riding! Montée du Rocher (The Rock) is called this because the bedrock was cleaned by the glacier that covered this area 10,000 years ago in the last ice age. Apple blossom season has arrived. Joy is boundless. Because the bridge is "Pont Barré," the only way to complete this ride in 2012 is to cross the do this. The Rivière aux Outardes Est bridge on Montée de Covey Hill is closed. There is no bridge in May 2012. The ride is now in downhill mode. perfect dusk light as we cross the Chateauguay river at Allan's corners, building at right is the war of 1812 battle of Chateauguay museum, and is where we parked. looks nice, I will try it this weekend!